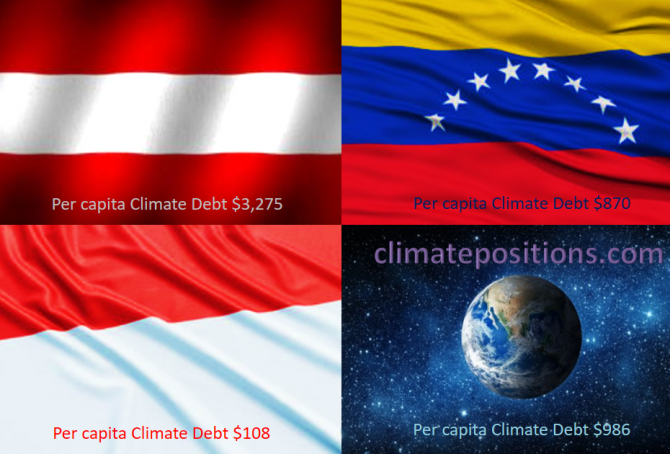 The diagram below shows ‘Share of global Climate Debt‘ in 2010, 2015 and 2017 of Austria, Indonesia and Venezuela (ranked 28th, 29th and 30th). 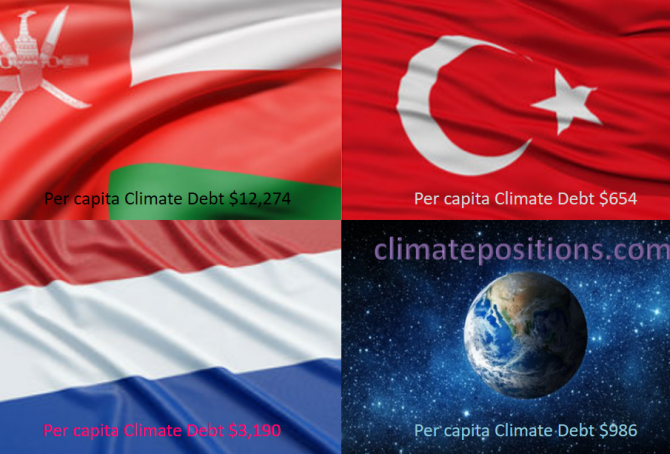 In 2015, the shares of each of the three countries were 0.40 or 0.41% of global Climate Debt. The diagram below shows ‘Share of global Climate Debt‘ in 2010, 2015 and 2017 of Poland, Belgium and Brazil (ranked 25th, 26th and 27th). By 2015, the shares of the three countries were similar. Since then, the Polish performance has declined, relatively. 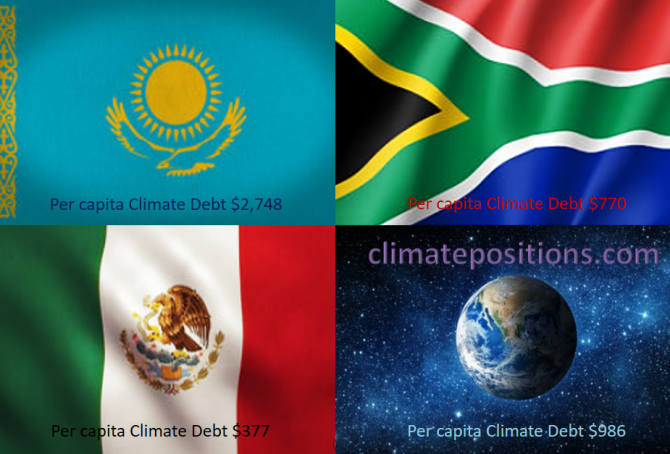 The diagram below shows ‘Share of global Climate Debt‘ in 2010, 2015 and 2017 of Kazakhstan, Mexico and South Africa (ranked 22nd, 23rd and 24th). 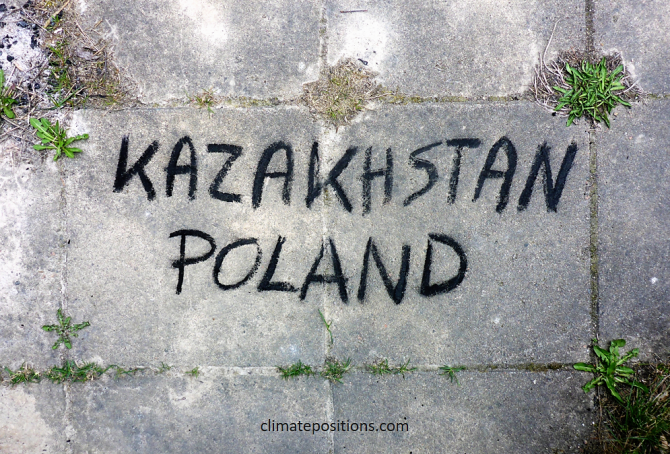 Kazakhstan’s share increased dramatically in a short period of time due to growing Fossil CO2 Emissions. The diagram below shows ‘Share of global Climate Debt‘ in 2010, 2015 and 2017 of Oman, Netherlands and Turkey (ranked 19th, 20th and 21st). The share Netherlands is decreasing steadily, whereas Turkey’s is increasing. 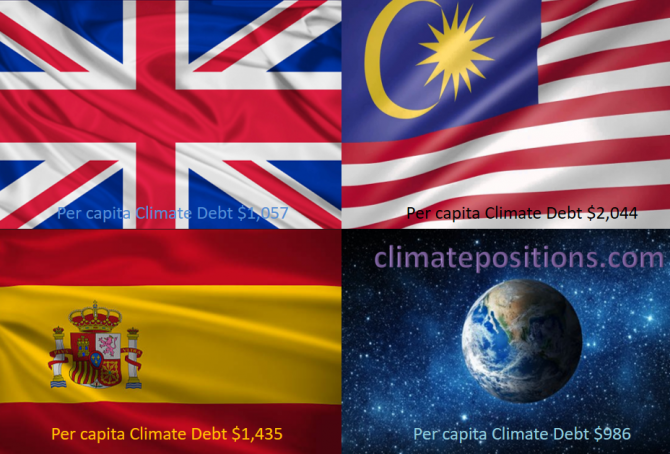 The diagram below shows ‘Share of global Climate Debt‘ in 2010, 2015 and 2017 of the United Kingdom, Spain and Malaysia (ranked 16th, 17th and 18th). The shares of the United Kingdom and Spain are decreasing, while the Malaysian share is increasing. The diagram below shows ‘Share of global Climate Debt‘ in 2010, 2015 and 2017 of France, United Arab Emirates and Italy (ranked 13th, 14th and 15th). The share of United Arab Emirates has increased along with an extreme population growth. 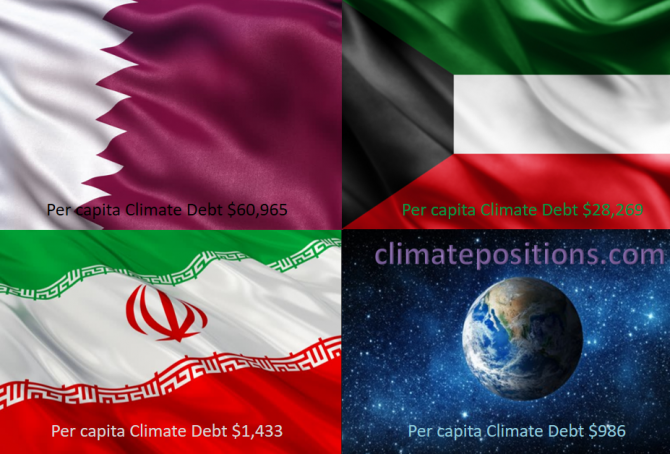 The diagram below shows ‘Share of global Climate Debt‘ in 2010, 2015 and 2017 of Qatar, Iran and Kuwait (ranked 10th, 11th and 12th). The share of Qatar has increased fast along with the extreme population growth. All three countries seem to have peaked on global shares around 2015. 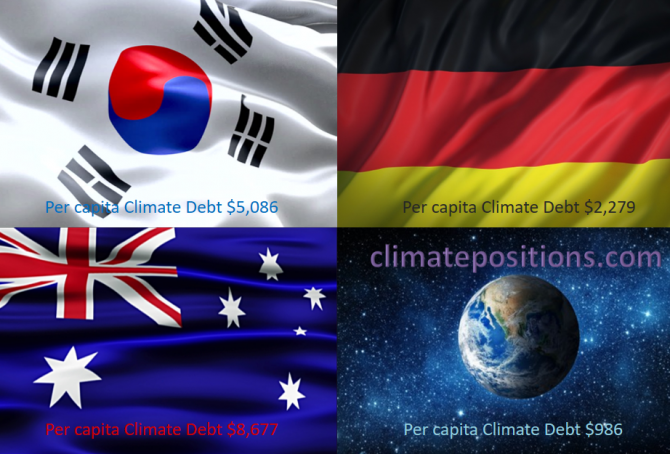 The diagram below shows ‘Share of global Climate Debt‘ in 2010, 2015 and 2017 of South Korea, Australia and Germany (ranked 7th, 8th and 9th). The South Korean share is stable over time, Australia’s is decreasing although at a slower rate lately, while Germany’s is increasing. 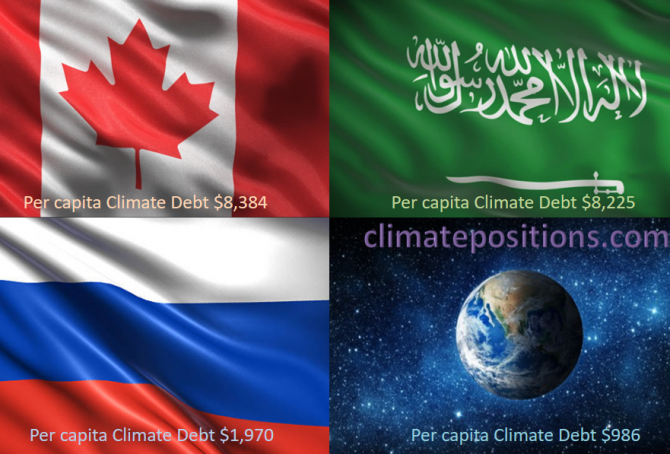 The diagram below shows ‘Share of global Climate Debt‘ in 2010, 2015 and 2017 of Canada, Russia and Saudi Arabia (ranked 4th, 5th and 6th). Canada’s share is decreasing, while Russia’s and Saudi Arabia’s are increasing. Global Climate Debt accumulated since 2000 is $7.2 Trillion. The diagram below shows ‘Share of global Climate Debt‘ in 2010, 2015 and 2017 of the United States, Japan and China (ranked 1st, 2nd and 3rd). The shares of the United States and Japan are decreasing at slower rates lately, whereas China’s is increasing fast. Global Climate Debt accumulated since 2000 is $7.2 Trillion. 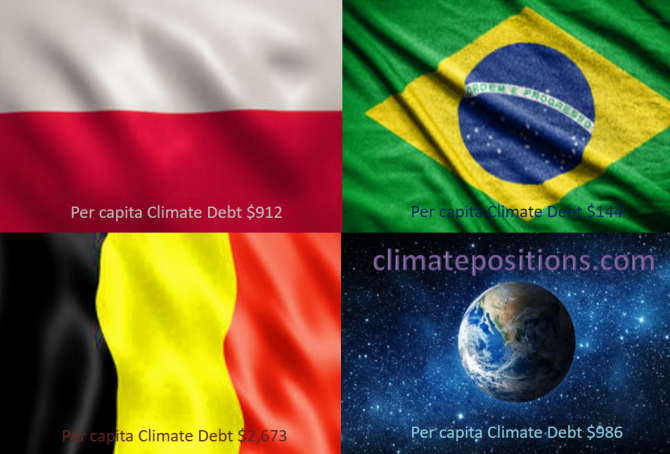 As announced in the previous ‘Article‘ the calculations of Climate Debt by country in ClimatePositions has now been updated with CO2 Emissions data from ‘EDGAR‘ (European Commission), instead of data from Global Carbon Project (CDIAC). At the same time, the global CO2 target has been raised by 0.2 tons per capita by 2025, and the indicators of Ecological Footprint (without carbon) and GDP (ppp-$) 2016 have been updated as well. New updated rankings are available in the menu “Climate Debt” above. Updated data and diagrams with all ‘Indicators‘ and all countries are available in the submenu ‘Calculations (Excel)‘. The table below shows the new ranking of 163 countries in comparison with the previous (last) ranking (159 countries) with emission data from Global Carbon Project (CDIAC). 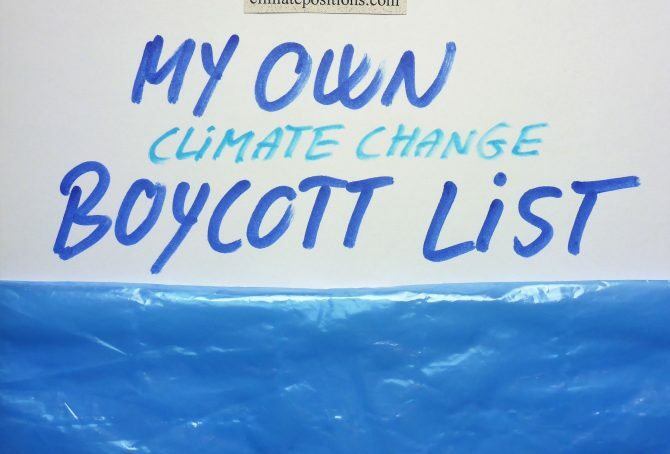 No Climate Debt is marked “free”. 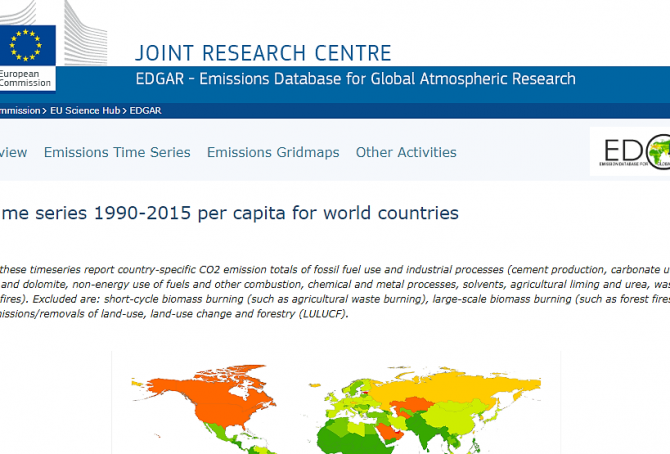 Only Montenegro is excluded from the new ranking due to missing CO2 Emission data (ranks 69th in the previous ranking). 2016-updates of national per capita GDP(ppp-$) from ‘World Bank‘ is now available in ‘Calculation (Excel)‘. The world’s average per capita GDP(ppp-$) grew from $15,668 in 2015 to 16,136 in 2016 (3.0% growth). The diagram below shows the development in per capita GDP(ppp-$) 2000-2016 of the world’s five largest per capita emitters of CO2 from Fossil Fuel and cement: Qatar, Trinidad and Tobago, Kuwait, Bahrain and Brunei; in comparison with the world average. 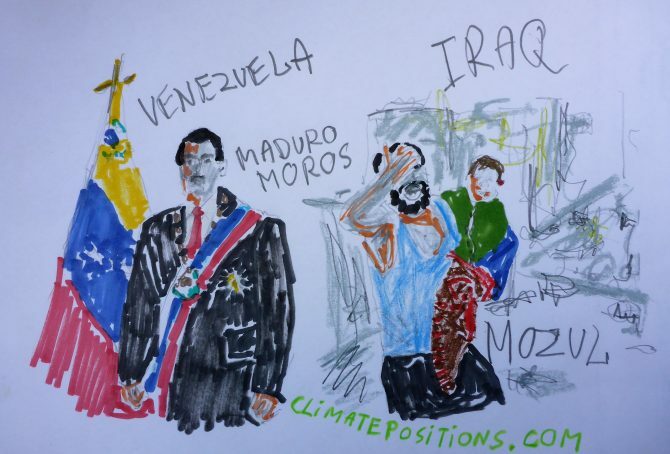 Venezuela holds the world’s largest proven oil reserves and the 8th largest proven natural gas reserves, while Iraq ranks 5th on oil and 12th on gas. Together, the two countries hold nearly 27% of the world’s proven reserves of oil and 5% of its natural gas. The two tables below rank the 15 countries with the largest proven oil and natural gas reserves and their world shares. Combined, the 19 Fossil Fuel countries listed below hold 93% of the world’s proven oil reserves and 88% of the proven natural gas reserves. They represent 38% of the global population, 62% of the global CO2 Emissions from Fossil Fuels (2015) and 74% of the current global Climate Debt in ClimatePositions (the combined share of the global Climate Debt of the 15 countries has increased by 3.6% since 2012; see the ‘Ranking‘. 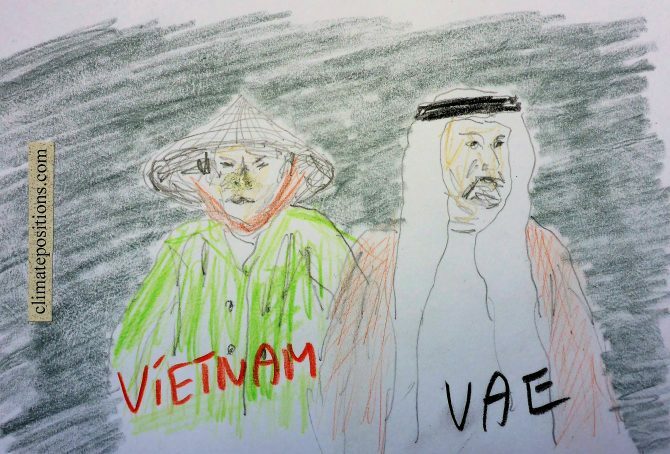 The difference in climate change performance of Vietnam and United Arab Emirates (UAE) is somewhat educational. Vietnam’s Climate Debt is $14 per capita, while the authoritarian oil state of UAEs is $10,884 (see the latest ‘Ranking‘). The two countries are the world’s 27th and 28th largest emitters of CO2 from Fossil Fuels (without bunker) and cement – combined, they emitted 0.52 % of the global CO2 in 2015. The following examines the ‘Indicators‘ of CO2 Emissions, Population, GDP(ppp-$) and Forest Cover (including Primary Forest). First, the diagram below shows the national shares of the global Climate Debt, in 2017 and 2012. Both countries increased their shares in recent years, although at completely different levels and in unalike ways. 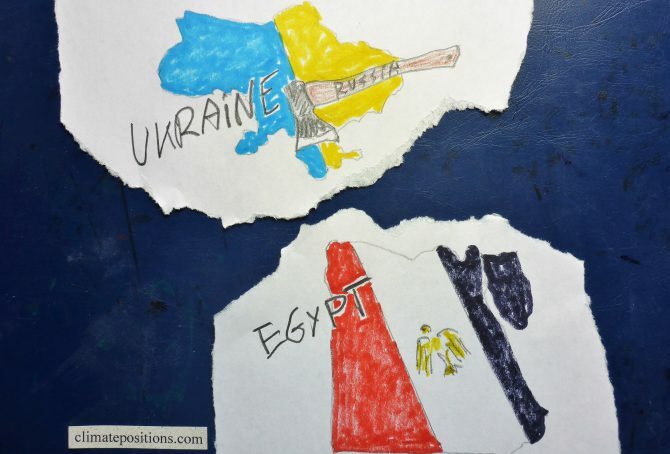 Egypt and Ukraine are the world’s 25th and 26th largest emitters of CO2 from Fossil Fuels and cement. Combined, the two countries were responsible for 1.2% of global CO2 Emissions in 2015. The following examines the ‘Indicators‘ of CO2 Emissions, GDP(ppp-$), Ecological Footprint and the Ukrainian Nuclear Power. The diagrams below show the per capita CO2 Emissions from Fossil Fuel (without bunkers) and cement, since 2000. The green bars show the Free Emission Level¹ – the exceedance is the basis for calculating the national Climate Debt. Malaysia and Spain are the world’s 23rd and 24th largest emitters of CO2 from Fossil Fuels and cement. Combined, the two countries were responsible for 1.4% of world CO2 Emissions in 2015. The following examines the ‘Indicators‘ of CO2 Emissions, GDP(ppp-$), Forest Cover (and Primary Forest) and Environmental Performance. The diagrams below show the per capita CO2 Emissions from Fossil Fuel (without bunkers) and cement, since 2000. The green bars show the Free Emission Level¹ – the exceedance is the basis for calculating the national Climate Debt. 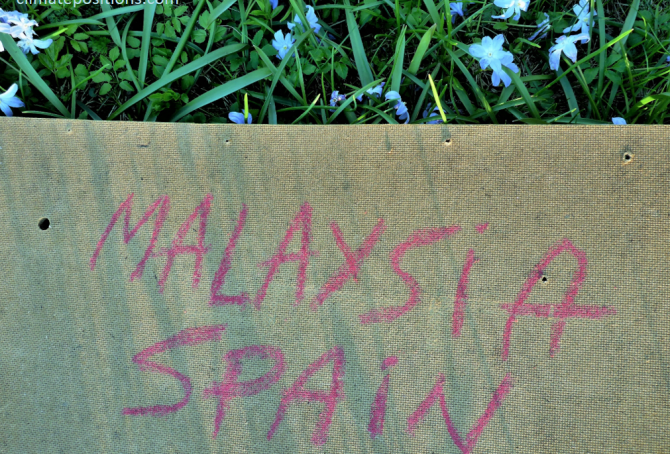 The Spanish reductions are pretty much balanced by the Malaysian increases … which is world symptomatic. 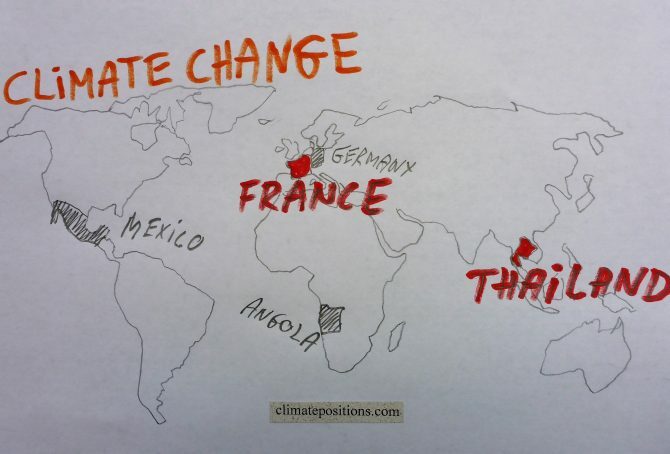 Thailand and France are the world’s 19th and 20th largest emitters of CO2 from Fossil Fuels and cement. Combined, the two countries were responsible for 1.8% of world CO2 Emissions in 2015. The following examines the ‘Indicators‘ of CO2 Emissions, GDP(ppp-$), Ecological Footprint, Forest Cover and Nuclear Power. 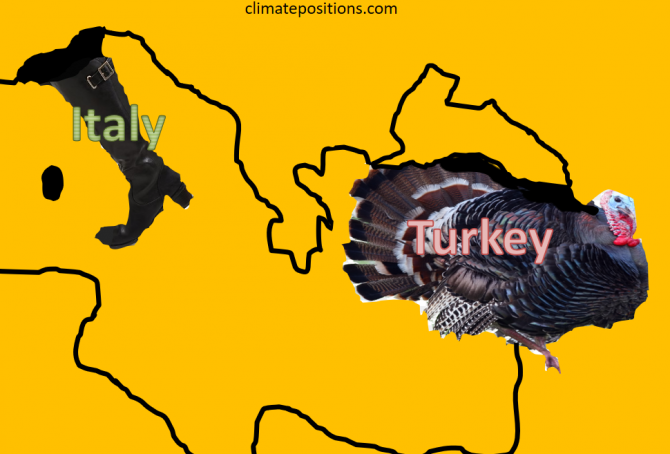 Turkey and Italy are the world’s 17th and 18th largest emitters of CO2 from Fossil Fuels and cement. Combined, the two countries were responsible for 2.0% of world CO2 Emissions in 2015. The following examines the ‘Indicators‘ of CO2 Emissions, GDP(ppp-$) and Forest Cover (including Primary Forest). 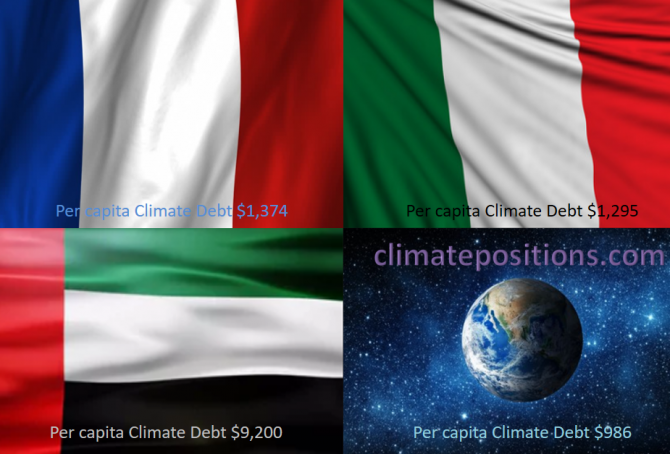 A) Countries with per capita Climate Debts more than 10 times world average: Qatar, Kuwait, Brunei, Luxembourg, Trinidad and Tobago, United Arab Emirates and Oman. 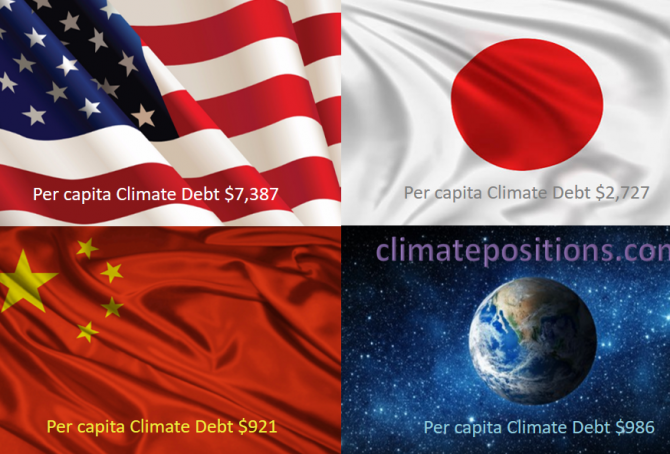 B) Countries with per capita Climate Debts between 5 and 10 times world average: Saudi Arabia, United States, Bahrain, Australia, Norway, Equatorial Guinea, Canada and South Korea. Among the fifteen countries only Luxembourg and South Korea are not among the world’s twenty largest per capita Fossil Fuel producers (read the article: ‘How green are the fossil fuel producers? 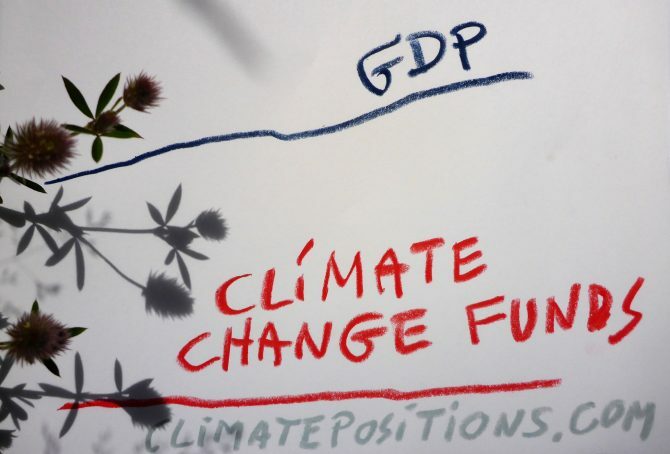 (Correlation between fossil fuel production, CO2 Emissions, GDP and Climate Debt)‘. The table below shows some key data of the fifteen countries. The table is read like this: 1) Between 1990 and 1999 Qatar emitted 55.1 tons of CO2 from Fossil Fuels (without bunker) and cement, annually per capita, 2) Between 2000 and 2015 Qatar emitted 51.7 tons (the average Climate Debt Free Level¹ was 32.4 tons), and 3) Qatars GDP(ppp) per capita was $143,788 in 2015.